Haven’t been doing much of interest lately – life has suddenly become duller after the crazy week with Jo’s wedding and all that. 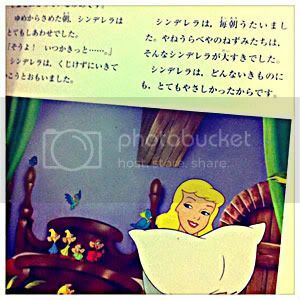 But I’ve been slowly trying to read “Cinderella” in Japanese. Bit by bit, when I can manage the time (I’ve been distracted by a Japanese TV drama series, by having to compile photobooks of my UK pictures, and by the puppy). Borrowed the book from a friend of my mother’s some time ago but didn’t get very far at first. It sat on my shelf for over a year and I made sporadic attempts at reading but didn’t get very far. Picked up the book again a few days ago and tried again. I comprehended more than I thought I would. That is to say, I managed four pages before getting to a line I really couldn’t make out. Surprised myself, really. (And it is really rare that I feel that I’ve achieved something.) Well, it’s a storybook meant for kids aged 3-6 so it’s not actually very impressive for someone almost 27 to be just managing to read it. But still! …I’ll take what small joys I can get. It IS a second (or rather fourth or so) language. And it’s all in those squiggly things!